For other people named John Randolph, see John Randolph (disambiguation). John Randolph (June 2, 1773 – May 24, 1833), known as John Randolph of Roanoke,[note 1] was a planter and a Congressman from Virginia, serving in the House of Representatives at various times between 1799 and 1833, and the Senate from 1825 to 1827. He was also Minister to Russia (1830). After serving as President Thomas Jefferson's spokesman in the House, he broke with the president in 1805 as a result of what he saw as the dilution of traditional Jeffersonian principles as well as perceived mistreatment during the impeachment of Samuel Chase, in which Randolph served as chief prosecutor. Following this split, Randolph proclaimed himself the leader of the "Old Republicans" or "Tertium Quids", a wing of the Democratic-Republican Party who wanted to restrict the role of the federal government. Specifically, Randolph promoted the Principles of '98, which said that individual states could judge the constitutionality of central government laws and decrees, and could refuse to enforce laws deemed unconstitutional. A quick-thinking orator with a remarkable wit, he was committed to republicanism and advocated a commercial agrarian society throughout his three decades in Congress. Randolph's conservative stance, displayed in his arguments against debt and for the rights of the landed gentry, have been attributed to his ties to his family estate and the elitist values of his native Southside Virginia. His belief in the importance of a landed gentry led him to oppose the abolition of entail and primogeniture: "The old families of Virginia will form connections with low people, and sink into the mass of overseers' sons and daughters". Randolph vehemently opposed the War of 1812 and the Missouri Compromise of 1820; he was active in debates about tariffs, manufacturing, and currency. With mixed feelings about slavery, he was one of the founders of the American Colonization Society in 1816, to send free blacks to a colony in Africa. At the same time, he believed that slavery was a necessity in Virginia, saying, "The question of slavery, as it is called, is to us a question of life and death ... You will find no instance in history where two distinct races have occupied the soil except in the relation of master and slave." In addition, Randolph remained dependent on hundreds of slaves to work his tobacco plantation. However, he provided for their manumission and resettlement in the free state of Ohio in his will, providing monies for the purchase of land and supplies. They founded Rossville, now part of Piqua, Ohio and Rumley, Ohio. Randolph was admired by the community and his supporters for his fiery character and was known as a man that was passionate about education and equality for all. He applied rousing electioneering methods, which he also enjoyed as a hobby. Randolph appealed directly to yeomen, using entertaining and enlightening oratory, sociability, and community of interest, particularly in agriculture. This resulted in an enduring voter attachment to him regardless of his personal deficiencies. His defense of limited government appeals to modern and contemporary conservatives, most notably Russell Kirk (1918–1994). Randolph was born at Cawsons, Virginia (now in Hopewell, Virginia), the son of rich tobacco planter John Randolph (1742–1775) and Frances Bland (1744–1788). His families, the Randolph family of Virginia and the Bland family of Virginia, are both counted among the prominent First Families of Virginia and were close cousins to each other. He was the grandson of both Richard Randolph and Theodorick Bland of Cawsons who were, respectively, the grandson and great-grandson of William Randolph and Mary Isham of Turkey Island. He was the first cousin once removed of both Richard Bland and Peyton Randolph, the two pillars of the First Continental Congress, the nephew of Congressman Theodorick Bland and stepnephew of Thomas Tudor Tucker, a half brother of Henry St. George Tucker, Sr. and Nathaniel Beverley Tucker, and a second cousin of Thomas Jefferson. Jefferson's mother was the daughter of Isham Randolph of Dungeness. His stepfather, St. George Tucker, married his widowed mother in 1778. His maternal fourth great grandfather was Richard Bennett of Virginia, elected governor of Virginia colony during the Cromwell Protectorate and a Puritan who in 1672 was converted to the Quaker movement by George Fox. A genetic aberration — possibly Klinefelter syndrome — left him beardless and with a soprano prepubescent voice throughout his life. First studying under private tutors, Randolph attended Walter Maury's private school, then the College of New Jersey, and Columbia College, New York City. He studied law in Philadelphia, but never practiced. Randolph maintained many friendships which crossed political party lines. As an example, he remained close with Federalist Congressman Harmanus Bleecker of Albany, New York. Bleecker and Randolph exchanged portraits as a token of their mutual esteem, and each displayed in his home the portrait of the other. Randolph is buried Hollywood Cemetery, Richmond, Virginia. Mr. Randolph goes to the House booted and spurred, with his whip in hand, in imitation, it is said, of members of the British Parliament. He is a very slight man but of the common stature. At a little distance, he does not appear older than you are; but, upon a nearer approach, you perceive his wrinkles and grey hairs. He is, I believe, about thirty. He is a descendant in the right line from the celebrated Indian Princess, Pochahontas. The Federalists ridicule and affect to despise him; but a despised foe often proves a dangerous enemy. His talents are certainly far above mediocrity. As a popular speaker, he is not inferior to any man in the House. I admire his ingenuity and address; but I dislike his politics. Randolph was chairman of the Committee on Ways and Means in the Seventh through the Ninth Congresses, acting as the Democratic-Republican party leader. After breaking in 1806 with his cousin, President Thomas Jefferson, he founded the Tertium quids, a faction of the Democratic-Republican Party that called for a return to the Principles of 1798 and renounced what it saw as creeping nationalism. Although he greatly admired the political ideals of the Revolutionary War generation, Randolph, influenced by Southern anti-Federalism, propounded a version of republicanism that called for the traditional patriarchal society of Virginia's elite gentry to preserve social stability with minimal government interference. Randolph was one of the Congressional managers who conducted the successful impeachment proceedings against John Pickering, judge of the United States District Court for New Hampshire, in January 1804. Critics complained that he mismanaged the failed impeachment effort in December of the same year against Samuel Chase, Associate Justice of the Supreme Court of the United States. In June 1807 Randolph was the foreman of the Grand Jury in Richmond, which was considering the indictment of Aaron Burr and others for treason. By the end of the review, he was angry with Thomas Jefferson for supporting General James Wilkinson, Burr's chief accuser. He considered Wilkinson less than a reputable and honorable person. Defeated for reelection in 1812 due to his opposition to the War of 1812, Randolph was elected in 1814 and 1816. He skipped a term, then was reelected and served from 1819 until his resignation in 1825. In 1823-1824, John Randolph was asked to seek office as the Democratic-Republican Party candidate for the office of U.S. President in time for the 1824 U.S. presidential election. He declined this offer. Randolph was appointed to the U.S. Senate in December 1825 to fill a vacancy, and he served until 1827. Randolph was elected to the Congress again in 1826, becoming the Chairman of the Committee on Ways and Means. In 1825 he talked for several days in opposition to a series of measures proposed by President John Quincy Adams; Randolph argued these measures would give advantage to the emerging industrial powers of New England at the expense of the Southern states. This series of speeches was the first Senate filibuster. Randolph was a member of the Virginia Constitutional Convention of 1829-1830 at Richmond as a delegate from Charlotte County. He was appointed United States Minister to Russia by President Andrew Jackson and served from May to September 1830, when he resigned for health reasons. Elected again in 1832, he served until his death in Philadelphia on May 24, 1833. He never married. Stoop o'er his Old Dominion! Despite being a Virginia gentleman, one of the great orators in the history of Caroline,[further explanation needed] and House leader, Randolph after five years of leadership became (1803) a permanent outsider. He had personal eccentricities which were made worse by his lifelong ill health (he died of tuberculosis), heavy drinking, and occasional use of opium. According to Bill Kauffman, Randolph was "a habitual opium user [and] a bachelor who seems to have nurtured a crush on Andrew Jackson." Modern science has established that latent pulmonary tuberculosis can sometimes settle in the genital tract and can cause the symptoms and permanent damage that would prevent the onset of puberty. 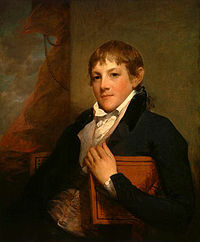 Randolph's brother died of tuberculosis, and it appears that Randolph contracted it as a youth and never went through puberty. He finally died of tuberculosis at age 60, after it broke out into the open. He began to use opium as a way to deal with the extreme pain caused by his lifelong battle with tuberculosis. Contemporary accounts attest to his having had a belligerent and bellicose personality before the onset of any disease. Randolph once fought a duel with Henry Clay,[further explanation needed] but otherwise mostly kept his bellicosity for the floor of Congress. He routinely dressed in a flashy manner, often accompanied by his slaves and his hunting dogs. "[W]hen Clay had set about making the speakership a position of true power upon his first election to that post in 1811, he had unceremoniously ordered Randolph to remove his dog from the House floor—something no previous Speaker had dared to do." Randolph had an intense dislike for Rep. Willis Alston and had a pitched fight with him in a Washington boarding house. Heated words led to the two throwing tableware at each other. Six years later, they fought again in a stairwell at the House after Alston loudly referred to Randolph as a "puppy". Randolph beat Alston bloody with his cane and the two had to be separated by other congressmen. Randolph was fined $20 for this breach of the peace. Together with Henry Clay, Randolph was one of three founders of the American Colonization Society (ACS) in 1816, a collaboration of slaveholders and abolitionists that planned to transport and resettle free blacks in a colony in Africa (this territory became Liberia). Like some other slaveholders, Randolph had long been opposed to slavery in theory. In the two decades after the Revolutionary War, so many planters freed slaves that the proportion of free blacks in Virginia increased from less than one percent in 1782 to 13.5 percent in 1810. In 1819, Randolph provided in his will for the manumission of his slaves after his death. He wrote, "I give and bequeath to all my slaves their freedom, heartily regretting that I have ever been the owner of one." Three years later, in 1822, in a codicil to that will, he stipulated that money be provided to transport and settle the freed slaves on land to be purchased in the free state of Ohio. Each slave above the age of 40 was to receive 10 acres of land. He provided for the manumission of hundreds of slaves in his will. Although the will was challenged in the courts, his slaves were finally ruled to be free. After a lengthy court case, his will was upheld. In 1846, three hundred and eighty-three former "Randolph Slaves" arrived in Cincinnati, before settling in Rumley, Shelby County, Ohio. Many of them ultimately settled at Rossville near Piqua, Ohio, of which only the community cemetery remains. 1799; Randolph was elected to the U.S. House of Representatives with 40.54% of the vote, defeating Federalists Powhatan Bolling and Clement Carington. 1801; Randolph was reelected unopposed. 1823; Randolph was reelected unopposed. 1825; Randolph was reelected unopposed. 1827; Randolph was reelected unopposed. 1833; Randolph was reelected unopposed. Randolph was raised and remained within the Episcopal Church. Although he went through a phase of youthful irreligion, in 1818 he had a crisis ending in a conversion experience, all of which he recounted in letters to several friends. Randolph's life thereafter was marked with piety. For example, he wrote to John Brockenbrough that he was restrained from taking communion "by the fear of eating and drinking unrighteously." Thus, the executors of Randolph's last will and testament included Virginia's bishop, William Meade. "We all know our duty better than we discharge it." "I am an aristocrat. I love liberty, I hate equality." "Time is at once the most valuable, and the most perishable of all our possessions." (In reference to the Embargo Act of 1807:) "It can be likened to curing corns by cutting off the toes." (In reference to President John Quincy Adams in 1826:) "It is my duty to leave nothing undone that I may lawfully do, to pull down this administration ... They who, from indifference, or with their eyes open, persist in hugging the traitor to their bosom, deserve to be insulted ... deserve to be slaves, with no other music to soothe them but the clank of the chains which they have put on themselves and given to their offspring." (In reference to Henry Clay ). "He is a man of splendid abilities but utterly corrupt. He shines and stinks, like a rotten mackerel by moonlight." According to Randolph's biographer, he was actually referring to Edward Livingston, not Clay. "From my earliest childhood I have been toiling & wearing my heart out for other people, who took all I could do & suffer for them as no more than their just dues." "... time misspent and faculties mis-employed, and senses jaded by labor, or impaired by excess, cannot be recalled any more than that freshness of the heart, before it has become aware of the deceits of others, and of its own." Randolph was elected a member of the American Antiquarian Society in 1815. His defense of limited government appeals to modern and contemporary conservatives, most notably Russell Kirk (1918–1994). 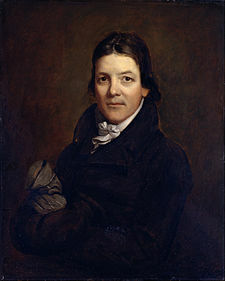 A modern conservative political group, the John Randolph Club, is named after Randolph. Randolph-Macon College and Randolph College also bear his name. Randolph County, Arkansas and Randolph County, Missouri are so named in his honor. His home, Roanoke Plantation, was listed on the National Register of Historic Places in 1973. Late in 1941, a Liberty Ship was named for him. Portrayed by Melvyn Douglas in the 1936 film The Gorgeous Hussy. Edgar Allan Poe in "The Facts in the Case of M. Valdemar" (1845) states that the fatally consumptive M. Valdemar "is (or was) particularly noticeable for the extreme sparseness of his person—his lower limbs much resembling those of John Randolph". Poe might have seen Randolph while living in Richmond, Virginia, from 1820 to 1827. Randolph, John. Collected letters of John Randolph of Roanoke to Dr. John Brockenbrough, 1812–1833, edited by Kenneth Shorey; foreword by Russell Kirk, Piscataway, NJ: Transaction Publishers, 1988. ^ Roanoke refers to Roanoke Plantation in Charlotte County, Virginia, not to the city of the same name. ^ Johnson, David (2012). John Randolph of Roanoke. LSU Press. pp. 37–39. ^ Page, Richard Channing Moore (1893). "Randolph Family". Genealogy of the Page Family in Virginia (2 ed.). New York: Press of the Publishers Printing Co. pp. 249–272. ^ Glenn, Thomas Allen, ed. (1898). "The Randolphs: Randolph Genealogy". Some Colonial Mansions: And Those Who Lived In Them : With Genealogies Of The Various Families Mentioned. 1. Philadelphia, Pennsylvania: Henry T. Coates & Company. pp. 430–459. ^ Caro, Robert (2003). Master of the Senate. New York: Vintage Books. p. 92. ISBN 978-0-394-52836-6. ^ Randolph Settlement/Jackson Cemetery (African) Archived 2013-12-21 at the Wayback Machine, Ohio Historical Society, 2008. Accessed 2013-12-20. ^ Owen, Lorrie K., ed. Dictionary of Ohio Historic Places. Vol. 2. St. Clair Shores: Somerset, 1999, 1002. ^ Russell Kirk, The Conservative Mind (1953), p. 130. ^ Hugh Rawson, Margaret Miner, ed. (2006). The Oxford Dictionary of American Quotations (Second ed.). p. 336. ^ Remini, Robert v. (1991). Henry Clay, Statesman for the Union. New York: W.W. Norton. pp. 83, footnote 32. ISBN 0-393-03004-0. ^ James E. Person (1999). Russell Kirk: A Critical Biography of a Conservative Mind. Madison Books. p. 79. ^ Charles W. Dunn and J. David Woodard (2003). The Conservative Tradition in America. Rowman & Littlefield. p. 90. ^ Russell Kirk, John Randolph of Roanoke: a Study in American Politics (1978). ^ Poe, Edgar Allan (1967). Galloway, David (ed.). Selected Writings. Harmondsworth: Penguin. p. 351. Devanny, John F., Jr. "'A Loathing of Public Debt, Taxes, and Excises': The Political Economy of John Randolph of Roanoke," Virginia Magazine of History and Biography 2001 109(4): pp 387–416. Kauffman, Bill. Ain't My America: The Long, Noble History of Anti-War Conservatism and Middle-American Anti-Imperialism, Metropolitan, 2008. Risjord, Norman K. The Old Republicans: Southern Conservatism in the Age of Jefferson (1965); the standard history of the Randolph faction. Tate, Adam L. "Republicanism and Society: John Randolph of Roanoke, Joseph Glover Baldwin, and the Quest for Social Order." Virginia Magazine of History and Biography 2003 111(3): 263–298. United States Congress. "John Randolph of Roanoke (id: R000047)". Biographical Directory of the United States Congress. Chisholm, Hugh, ed. (1911). "Randolph, John" . Encyclopædia Britannica (11th ed.). Cambridge University Press.